This is not just any pumpkin cake. 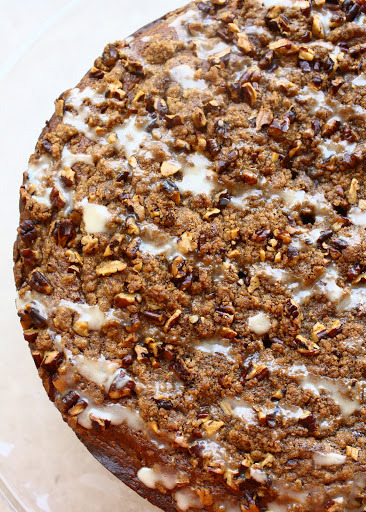 This Pumpkin Coffee Cake with Pecan-Brown Sugar Streusel is the first baked good I have made since submitting my first college application; and boy, did it taste sweet. Applying to college is like watching an action film: one moment you are energized and hopeful, a second later you become massively overwhelmed, and by the time the movie’s over, you’re so drained all you want to do is sleep. What better way to celebrate this whirlwind experience than with a little baking therapy? I baked slowly and leisurely, enjoying every moment of my return to the kitchen after a long separation. 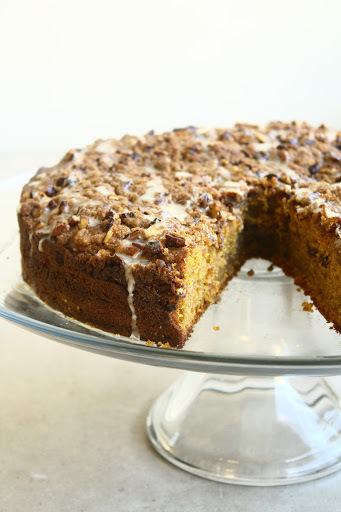 Spiced with cinnamon, nutmeg, and ground ginger and sprinkled with toasted pecans, this cake embodies fall flavors. 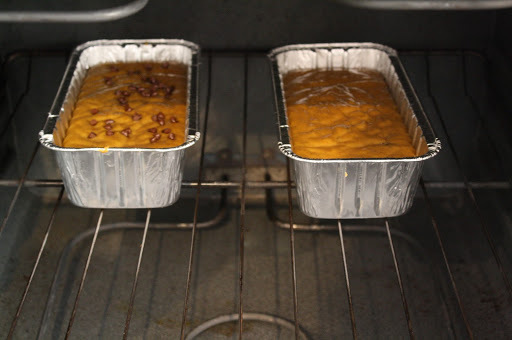 The batter is perfectly moist with a pumpkin taste that is present but not overpowering. My favorite part of any coffee cake is the buttery crumb topping. This cake has not just one, but two layers of nutty, sugary streusel, which means double the goodness. Cut into generous wedges and served with a cup of coffee, it makes a wonderful breakfast or afternoon snack. I particularly enjoy sneaking into the kitchen and nibbling on it sliver-by-sliver. Makes one 9-inch coffee cake. 1. Preheat the oven to 350 degrees F. Grease and flour a 9-inch springform pan or a 9-inch cake pan with 3-inch sides. To make the streusel, in a medium bowl, combine the flour, brown sugar, cinnamon, and salt. Add the cubes of butter and, using a pastry cutter or fork, break down the butter until the mixture resembles coarse crumbs. Stir in the toasted pecans. 2. To make the batter, in a large bowl, sift together the flour, baking powder, baking soda, cinnamon, ginger, nutmeg, and salt. In the bowl of a stand mixer fitted with a paddle attachment, beat the butter and brown sugar on medium-high speed until light and fluffy. Beat in the eggs, one at a time, scraping down the sides of the bowl with a rubber spatula. Add the pumpkin puree and sour cream and mix to combine. Add the flour mixture in thirds, incorporating on low speed. The batter will be quite thick. 3. Spread half of the batter into the prepared pan and sprinkle half of the streusel over the batter. Spread the remaining batter over the streusel and top with the remaining streusel. 4. Bake until a toothpick inserted into the center of the cake comes out clean, 50-55 minutes. Let the cake cool in the pan on a wire rack for 15 minutes. Remove the sides from the pan and slide the cake onto the rack. 5. To make the glaze, in a small bowl, whisk together the confectioners’ sugar, milk, and vanilla extract. Drizzle the glaze over the top of the cake. 2. In a large bowl, combine the dry ingredients. Add the pumpkin puree, oil, water, and eggs. Stir well. Add the chocolate chips. 5. 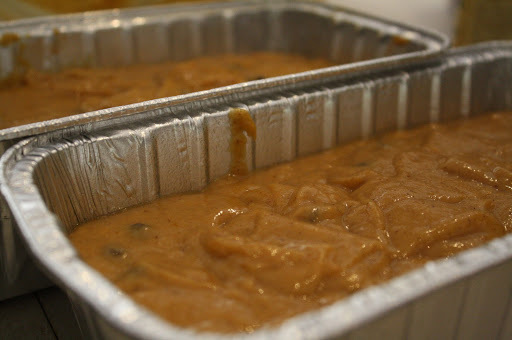 Pour the mix into loaf tins, leaving a fourth of each tin open. Bake until a toothpick inserted into the center comes out clean, about one hour. 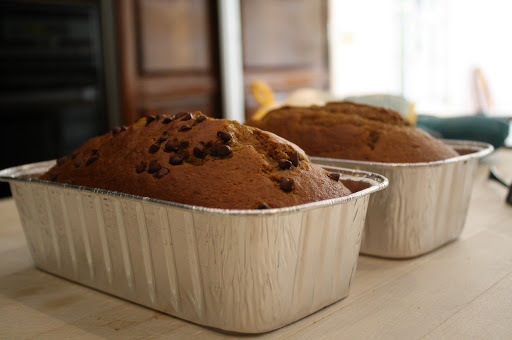 This moist pumpkin bread caters to a wide range of palettes and maintains its flavor for weeks after initially baking. Package each slice individually in plastic wrap, and you have an instant Thanksgiving goodie that will surely be appreciated. Served with a steaming mug of apple cider, the bread is a satisfying breakfast treat. No matter how you decide to enjoy this delectable baked good, I guarantee it will truly be a success!